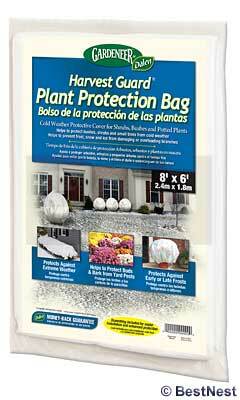 Protect your shrubs, trees, or flowerbeds from cold weather or insects using the Gardeneer Frost Protector Plant Bag. Covering your plants during late spring frosts keeps them viable for a longer time, for a lasting and beautiful yard. This bag fits securely around your shrub, tree, or potted plants, and the drawstring offers added protection. The white color allows light to enter, to help photosynthesis occur, and the cover may also be used to keep insects and other garden pests out of your flowers. This may result in less pesticide use, for more natural growth. This bag measures 8' by 6', for plenty of versatility in placement, and installing it over the plants is simple. Help your plants last longer with this Frost Protector Plant Bag.